Happy New Year everyone. Thank you to all who helped make this blog as successful as it was this year. Without readers this blog would not be anything nor fun to write…THANK YOU ALL! My resolution to try and be a better blog writer in 2013. Twice in one month is good for me lately. I want to thank everyone who stops by here to see what I have to say even if it is intermittent at best. I am starting my third year of this blog, it does not seem that long ago and I still feel like I don’t know what I am doing. I can write for this blog and put pictures in but other that I am a novice. After I feel comfortable with something I am okay and I can experiment. I am comfortable with the program I use to produce stitch guides for myself and others but I am not comfortable with photo editing…I just have not played with the program enough. Someday I would lie to make a new page layout, one that reflects more of a stitching theme. But after taking the web class this fall, I know I will never be a wiz at web designing and it just seems so daunting to me. I am a person who learns by reading and then doing and most of the time doing again and again. I prefer instructions to be #1, #2, #3…I can do this. But to play around with something, especially electronic things I freeze…what if I push the wrong button, what if …and the list goes on. I do have a large projects going on most of the time but I just don’t blog about them because the work is sporadic and I am usually doing computer work for others. I only stitch on the large projects when I have long periods of no interruption…this week-end I will have a Saturday where I am all alone (see me smiling from ear to ear…guys going Boy Scouting) and I will work on one of my two large projects (Deborah Forney’s Ho-Ho-Ho! Santa or Tony Minieri’s Chicago du Soir.) Usually in the evening I work on small projects that are…fast, easy and require little concentration. But this is one of those big projects I completed last year: St Basil’s, a Carole Lake design. I had it framed and am giving it to my second son, Hugh and his wife, Anne. Both turned 40 years old this month and Anne loves this piece. I do too! This piece is framed under glass; Hugh & Anne have dogs…big dogs. There are several reasons I do not blog about some of the pieces I stitch… as I said, the work is sporadic and I am usually doing computer work for others. 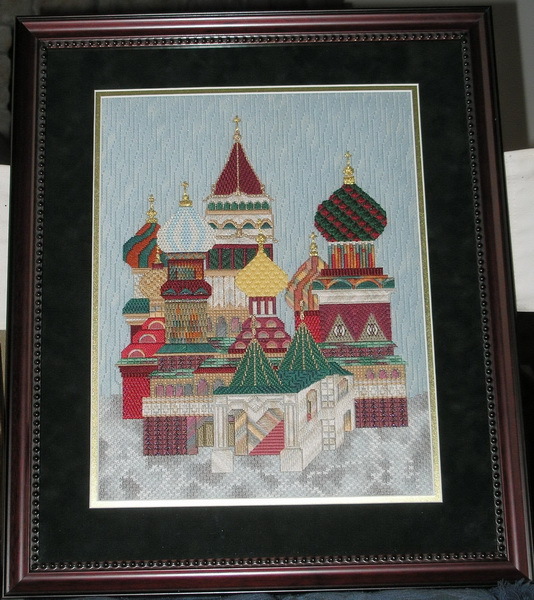 St Basil’s is one of the pieces I helped produce the stitch guide. I do not think it would be ethical for me to talk about these designs before they are released for teaching and sometimes they are not released for teaching or sale. Usually when I help produce stitch diagrams for a piece I feel like I have stitched the piece, even though it is just on paper. Many times, the order of the stitching will change and I will redo page layouts; after a pilot class there are revisions; And yes, even after the piece has been taught there are revisions. Remember Lucy? Well she is at the framers as we speak… you will see her soon. She’s been stitched for some time I just forgot about her in the busy-ness of last fall. Today I am off to work on the computer. We are 12 days into 2010 and I am just getting around to posting. This year I am going to make no promises about how often I will post. I seem to get bogged down in self-inflicted promises to myself. 2009 was a good year and a bad year. Seemed like everything would go along just fine and then the bottom would fall out. Nov 1st was one of the blackest days of the year. My friend Patty Morrison unexpectedly passed away . Patty was my needlework finisher and friend. It was quite a loss to her family and friends. Patty had the most infectious smile, bright outlook and happy attitude that you could not help but be uplifted by her even if you were just talking to her on the phone. 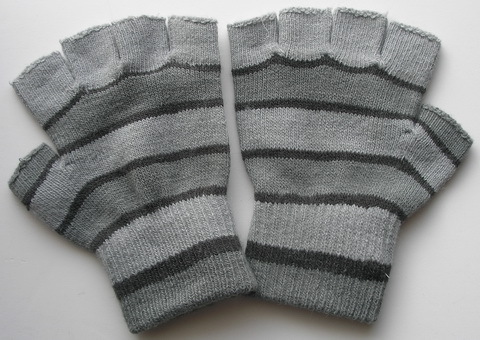 It was a loss that will be felt throughout this needlework community for a long time. I will never pick up a gold thread again and not think of Patty; her company name is “A Thread of Gold”. Her friend and assistant is going to carry on and that is a complement and credit to Patty. Started out 2009 with computer problems and ended 2009 the same way. This last episode fried the hard drive…bad news…but… good news…I was backing up the hard drive when it happened and so far looks like hopefully 95% of my data was saved. I have encountered a few problems but so far nothing I can’t repair or redo. And I found a computer angel who didn’t charge me an arm and a leg just to look at my computer and then turn it on at an hourly rate. He was so considerate too. Called me with 2 hours of having my baby and gave me the preliminary diagnoses and kept me informed every step of the way about what he was doing and the approximate co$t. I never realized how dependent I have become on this baby to keep me informed, connected and entertained. 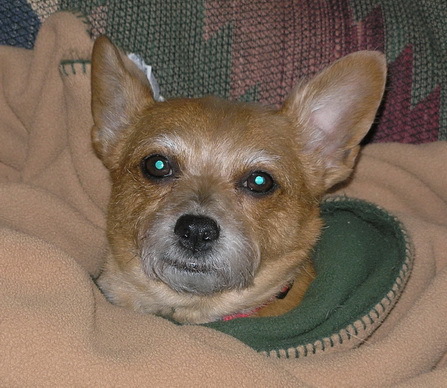 Now she is home, better than new (she got a memory enhancement too), and is appreciated more than ever and I have a new angel in my life. Since Dec24, we have had nothing but snow and cold, cold & snow… I do not mind the white stuff within reason, and as long as it is white and not dirty gray. I would prefer it came and went in small increments of 3-6 inches at a time but this winter it has been 3-6 inches on top of 3-6 inches and still more 3-6 inches. AND if it hasn’t been snowing, it is colder than…well I’ll let you file in the rest…cold and windy, with wind chills in the negative double digits. 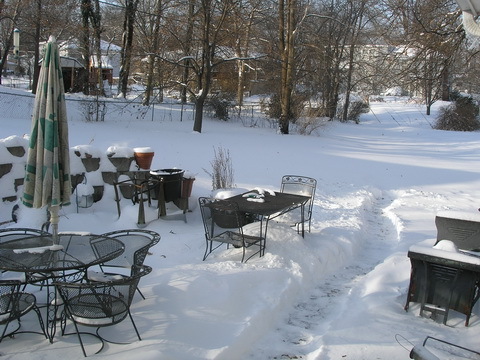 Here is a picture of my patio over the week-end. She gave Stewey at Spinster Stitcher (http://spinsterstitcher.blogspot.com) a run for the blanket. I don’t think she came out of this blanket more than three times a day for three days. And when she did come out the look was too much, I really think she expected me to go outside too (Thank goodness for indoor plumbing) and I know she would have preferred me to spoon feed her. I tried to explain to her that moving around kept your blood moving but I don’t think she believe a woman sitting next to a fireplace, under an electric lap robe with fingerless gloves stitching or reading and sipping warm tea. Oh well, it is a Mom-my-lism (Things your mother used to say, that you are NEVER going to repeat to your children): “A case of do as I say and not as I do”. We all have survived and yesterday it was a sunny 30 degrees…felt like the tropics of January. Today we are back to gray and 20 degrees…too many people must have been doing a happy dance and getting out of their cabins. But it is double digit degrees in the positive and no white stuff. And that is the last few months in a blog post. My family all live close (sometimes too close) and are all relatively healthy. My computer is back in the pink. These are all blessings and a great way to start the 2010 New Year and my third year blogging. This week I have had a blog one year. Granted it has not been the most active blog of the web, but it has been a learning experience and still is. I like the idea of an on-line journal, and I always have great intentions of writing…life and sleep just get in my way. I am going to try harder in 2009 but I not making any resolutions…I seem to break them first. I just promise to try. For those of you who have faith and keep looking and for those that just stumble in, I have a birthday present for you. This is a greeting card I designed in 2007 to send to my needlepoint friends. Now you can have your cake and stitch it too.